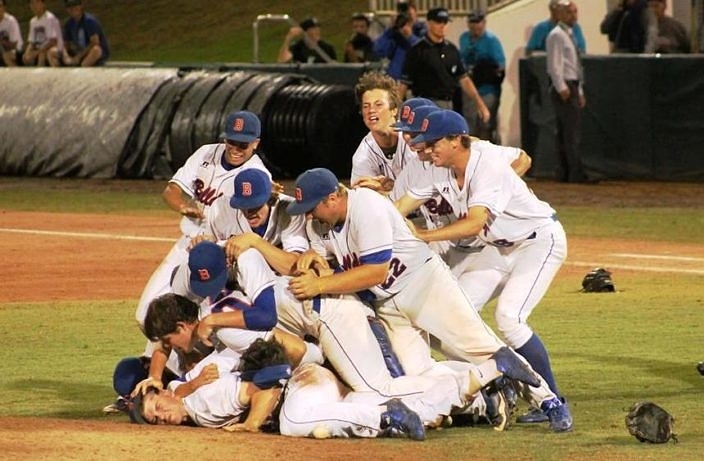 The Bulldogs dogpile after winning their second straight state title. Coming to the state tournament with a target on your back is not an enviable position. 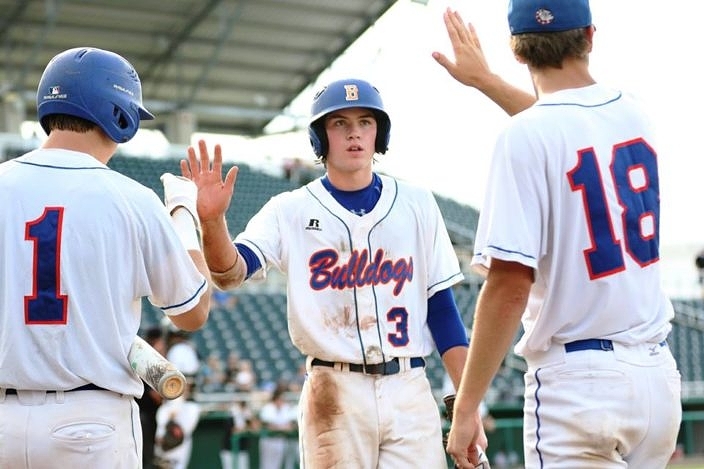 Yet the 2017 Bolles Bulldogs arrived as such, as the defending state champions. But they weathered the pressure and defended its title, and the team that arrived as champions also got to leave as champions. 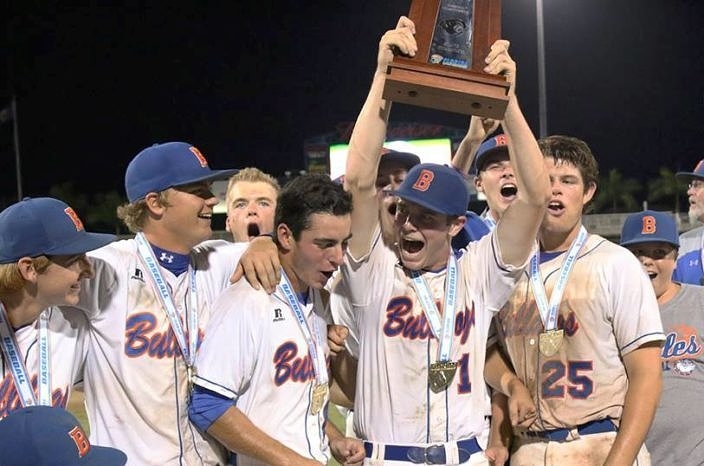 Behind a strong offensive outburst that staked the club to a huge lead in the first inning, Bolles rolled to a 7-2 win over Bishop Moore to win Thursday’s 5A state championship at Hammond Stadium in Fort Myers. It is the team’s second straight title and eighth overall in program history. The Bulldogs attacked with their bats right away to take a commanding lead in the top of the first. Max Ferguson led off with a double to right, Austin Knight was hit by a pitch and Clemente Inclan dropped down a great bunt and reached with a base hit that loaded up the bags. Hunter Barco put this team on the scoreboard with a fly ball deep to center field that allowed Ferguson to tag up and score for a sac-fly RBI. Mac Forrester then sent a liner past the shortstop to plate a pair and Bryson Kirksey followed with a bouncer past second for a two-RBI single and a 5-0 advantage that also chased Bishop Moore’s starter from the game. Bolles tacked on another run in the third. Brendan O’Neil singled past the shortstop, Nate Skinner sent a base hit to left field and Forrester walked to load the bases. Russell Libby then reached on an error that allowed O’Neil to score and increase it to a 6-0 lead. The lead gave Bulldogs starter Nathan Skinner all the comfort he could need. Since Skinner is a contact pitcher, the early offense made it that much easier to pitch to contact and let his defense make the plays behind him. The right-hander did his part by going the distance on the mound, allowing two earned runs on five hits while recording seven strikeouts without allowing any walks. The Hornets answered back to get on the scoreboard in the bottom of the fourth. Kyle Mock got it started with a two-out single to center, and then came all the way around to score when Fabian Escalante crushed a shot deep into the right-center field gap for an RBI triple. Connor Scheitzach followed with a shot deep to left field for an RBI double. Bolles added to its lead in the top of the sixth. Ferguson and Inclan both walked, and a fielder’s choice on an infield grounder erased Inclan advancing to second before the relay throw sailed high to allow Ferguson to round third base and scored standing up. The Bolles coaching staff is a large and crucial piece of the program. With a total of seven assistant coaches on staff, Boswell admits that it is very helpful that they have so many top-notch coaches working together as one unit. The coaches all communicate great together, they all like each other and they have developed a perfect relationship with the players that trust them and follow their guidance perfectly. Over the course of the two games in the Final Four, the Bolles coaching staff worked together to assist the players with every aspect of the experience. Guys were prepared for everything, they were instructed how to make the necessary adjustments, and the end results spoke for themselves.